In 1990 Dr. Rey Pagtakhan MP, Liberal-Winnipeg-St.Paul brought a private members motion forward to make accreditation for foreign trained professionals easier, this was shot down by both the Reform and Bloc Quebecois. In 1995 there was a discussion in the Manitoba legislature about IMGs and licencing but again the nothing happened. Unfortunately, due to the Canadian federal form of government, Canada has no national licencing standards, including the medical profession, plus the fact that the professional regulatory bodies are more closely intertwined with the professional associations and have more discretionary powers as to whom to licence (moreso than in the U.S.), initiatives to make access to the professions more equitable for foreign trained professionals often bog down amidst the efforts of the provincial governments' efforts to protect their turf as well as the professional groups lobbying to ensure that their members vested interests are protected (protestations about the need to maintain Canadian standards of health care, engineering, accountancy, etc. notwithstanding). As a result of the blame shifting that goes on whenever the issue of equal access to the professions arise Canadian foreign trained professionals in A.D. 2000 continue to face the same obstacles faced by their predecessors decades ago. 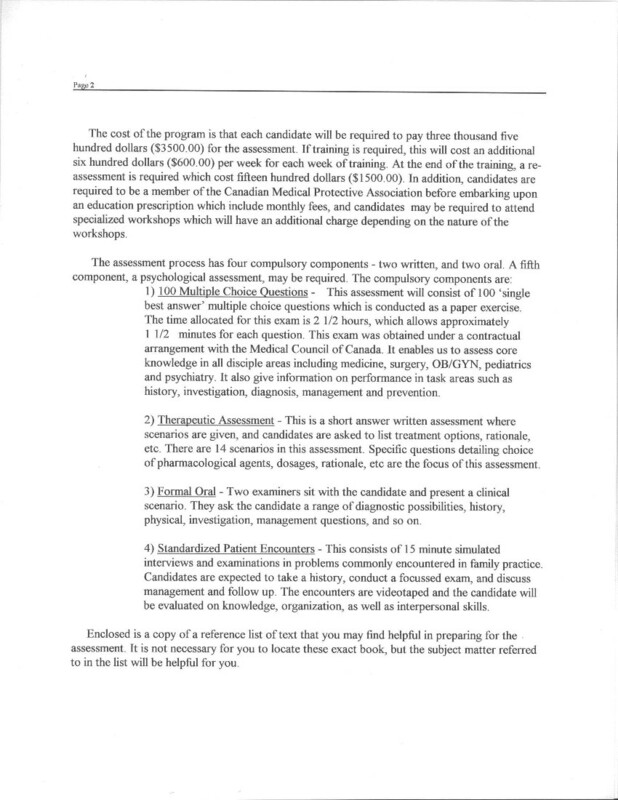 Of interest is a statistical study by the American College of International Physicians (look at page 8 of their 1999 2nd quarter newsletter) obtained from the California Board of Medicine (a state with more lawyers and a bigger population than Canada's) which showed no difference in the total number of complaints received against International Medical Graduates vis a vis American medical graduates. The statistics from New York did show a substantial difference (in the AMGs favour) though. The ACIP is studying these differences in the statistics from the two states further. Although the regulatory bodies keep harping on the need for maintaining Canadian standards we have not come across any statistically significant Canadian studies that DO show that Canadian International Medical Graduates coming from countries other than those currently favoured are subject to more complaints by their patients (which one would think would be a satisfactory index of patient satisfaction or outcomes) than International Medical Graduates from the favoured countries or Canadian medical graduates for that matter. 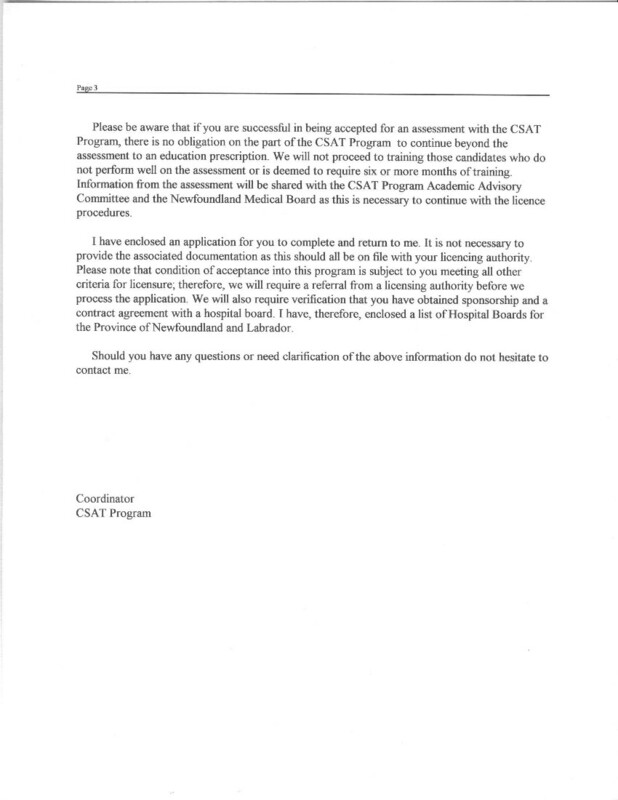 In 1996 the RCPSC decided that to make the playing field really fair, henceforth only International Medical Graduates trained to North American standards (previously U.S. and Mexican trained specialists needed to be trained to "Canadian Standards") would be allowed to sit for their exams and thus get Canadian accreditation (IMHO this was a more logical policy decision if the reason for disallowing International Medical Graduates from practicing in Canada is because they are not trained according to Canadian standards, considering the fact that the disease ecology, ethnic make up, diet, lifestyle and so on of the Canadian patient population is more nearly similar to the U.S., than of those countries that have historically been the source of Canadian International Medical Graduates). The Saskatchewan CPS protested this rule change (54% of physicians in Saskatchewan are International Medical Graduates, including the present (2001) Saskatchewan Medical Association president, trained in the UK, South Africa, Australia, New Zealand and Eire plus a minuscule percentage in the U.S.) as being unfair to "their" International Medical Graduates (what about International Medical Graduates from other countries?). Subsequently the RCPSC stated that they might change their previous policy decision and then decided they wouldn't and then thought they would, and then decided they would review IMG 's training on a case to case basis. And then finally did start enforcing their new regulations on January 2001 after 5 years of "reviewing" their 1996 decision (oh well better late than never). The Ontario CPSO (under present regulations only Canadian trained physicians are allowed to practise in Ontario) as well has also decided to review their standards for certification of International Medical Graduates (hopefully including requirements for US trained physicians). We hope this review will result in a more equitable process. But don't hold your breath though, they've already said the whole process would be dependent on provincial funding being available. The Canadian Resident Matching Service which matches all applicants for Canadian medical residencies. International Medical Graduates are eligible for the 2nd iteration of the match (after all the Canadian Medical Graduates have been matched) provided they have 1) Canadian citizenship or Canadian landed immigrant status, 2) passed the Medical Council of Canada Evaluating Examination, 3) passed the Medical Council of Canada Qualifying Examination part 1 (in some provinces) and 4) a high enough score in the TOEFL (passing score depends on which province the residency program is in). For the past 5 years there have usually been around 200-300 International Medical Graduates participating in the CARMS match with from 11-40 being matched. Compare that with these statistics on International Medical Graduates in the United States. Please note that all of the Provincially funded International Medical Graduate training programs are restricted to the residents of each respective province. here's the news release about the 8 positions for International Medical Graduate training similar to the OIMGTP, this program will commence on July 2001. 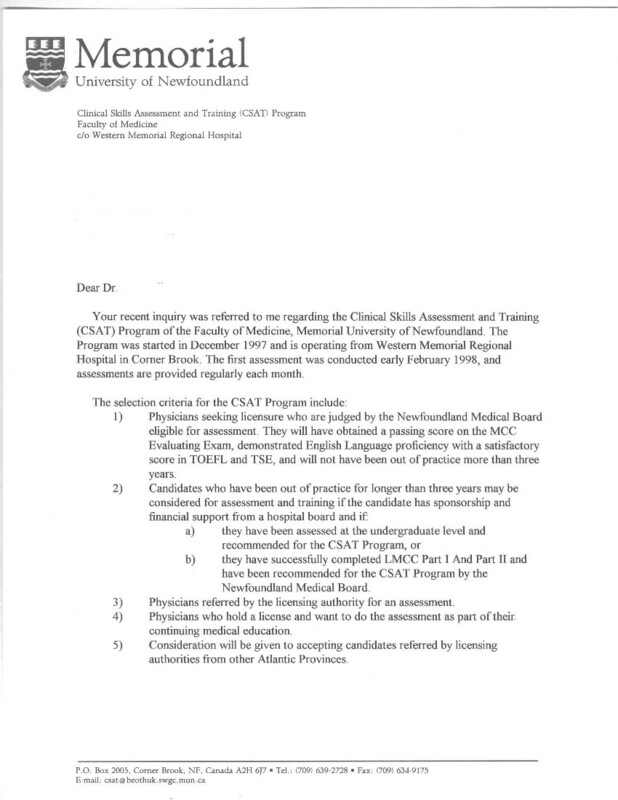 This an article from the MUN Gazette about the Clinical Skills Assessment Test for which one does not have to redo a residency in Canada. The International Medical Graduate has to meet certain requirements before being allowed to take the test and pay for the test (@C$3500 and another C$1500 for retesting if one flunks it the first time) and for flunkers, the weeks of required training (C$600/week) themselves. 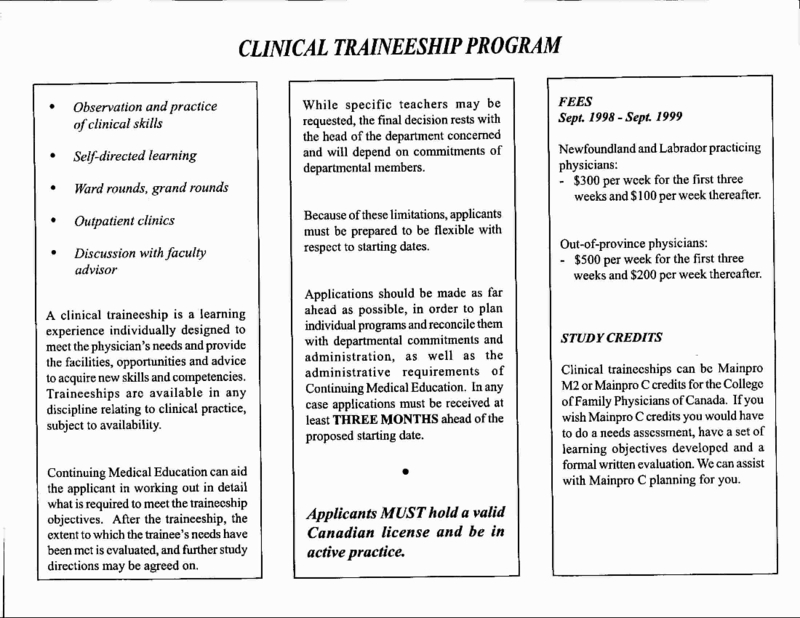 Here's an article about the Newfoundland Medical Association preceptorship program for International Medical Graduates as well as contact info (this program is for International Medical Graduates practicing in Newfoundland with a temporary licence). 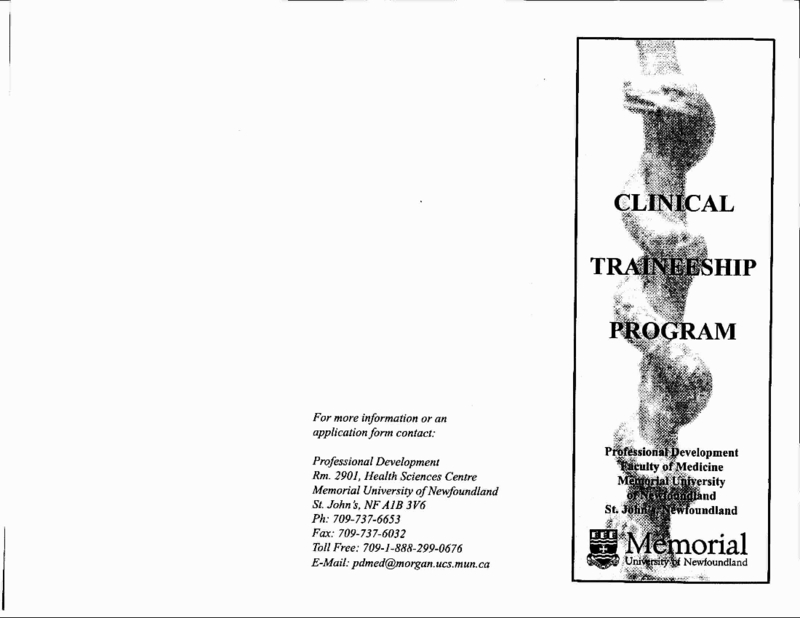 Additional information from the Dean's Office, Faculty of Medicine, University of Toronto (dated 1999). In addition the Faculty of Medicine, University of Toronto which says it has one of the largest training program for IMGs in North America has an office to help International Medical Graduates but it is mostly for foreigners who can afford to pay for Canadian medical training. Links to International Medical Graduate associations in Canada and the U.S.
E-mail address of immigrant advocacy group in Alberta interested in IMG issues. International Medical Graduate association in the U.S.
Another National International Medical Graduate association in the U.S. Advocacy group, plus links, mentorship and other programs to help immigrant professionals in Ontario. A collection of papers and speeches during the inaugural conference "Shaping the Future: Qualification Recognition in the 21st Century" held in Toronto on October 12-15, 1999.